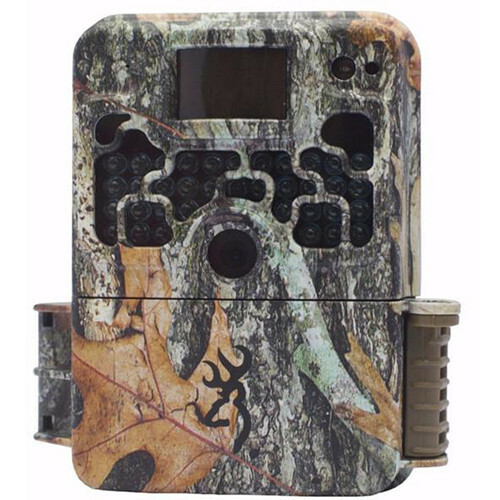 With a trigger speed as fast as 0.2 seconds and 0.6-second recovery time, the Browning BTC-5FHD5 Strike Force Gen 5 Trail Camera will make sure you don't miss any of the action, capturing 22MP photos and 1080p video of visitors to your hunting grounds. Many functions of the Strike Force Gen 5 can be adjusted to suit your camera's purpose and location. Trigger speed can be set from 0.2 to 0.7 seconds. The 80' detection range is adjustable. The infrared flash has a maximum range of 120' but can be set to Powersave, Long Range or Fast Motion, as needed, while Browning's Illuma-Smart technology adjusts the flash on individual shots for optimal photo quality. The Smart IR Video feature, meanwhile, keeps the camera rolling during the day, as long as game are present. The Time-Lapse Plus shooting mode captures images at pre-set intervals, and Browning's Buck Watch Time-Lapse Viewer Plus software, available for free download, stitches the time-lapse images into a video so you can watch a whole day's comings and goings in a few minutes. The camera can capture up to eight images in Multi-Shot or Rapid-Fire mode, providing multiple looks at game (or people) on your property. Photos and videos are recorded on a user-supplied SD memory card up to 512GB, and Browning's SD Card Management will overwrite older images when the card is full. The camera runs on six AA batteries, and can be powered by an external 12 VDC source.